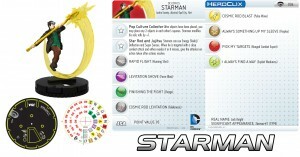 WizKids is showing off another mini for the upcoming Legion of Super Heroes set for HeroClix with a preview of Starman. Today we look at a member of the JSA who will be in the upcoming DC HeroClix: Superman and the Legion of Super Heroes set. Jack Knight (son of the original Starman), has a rich and full history. After taking up the mantel of Starman, Jack has traveled through time and space. Starman has shared adventures with the Legion of Super Heroes and even visited Krypton in the past, where me meet and gave counsel to a young Jor-El, the father of Superman.